With temperatures still pushing 90, it is hard to believe that we are already into autumn. At the same time, all that heat isn't doing us much solar cooking good, since we are still having summer rains and the accompanying clouds. Most days, the sun shines for at least a few hours, but over the weekend, we had steady rain and gray skies for 3 days straight. When the sun finally came out, albeit sporadically, today, I was anxious to get back to solar cooking. 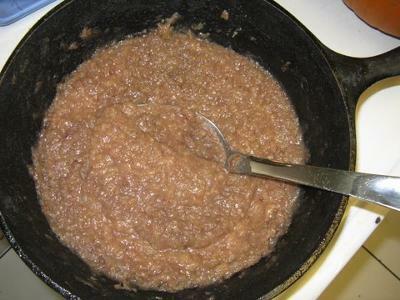 Knowing I'd need something forgiving of variable temperatures, I settled on a very fall-feeling food--applesauce. I peeled and cut about 8 apples into chunks, some old and squishy, some fresh and crisp, and tossed them with a tablespoon of softened butter. Since most dishes in the solar cooker end up with a lot of liquid, I borrowed a trick from my apple pie recipe, and made up a mix of a couple tablespoons of flour (to help thicken the sauce), 1 tablespoon cinnamon and about 1/3 a cup of sugar. I mixed most of it up with the apples and then sprinkled the last couple teaspoons on top. Between clouds and sporadic sprinkles, the oven temps only made it to between 200 F and 240 F, and I left the pan in from 12:30 to 5:15. The apples were beautifully brown and soft, and smelled divine when we took them out of the oven. There was, as anticipated, a lot of liquid in the pot, but after mashing the apples well, the sauce thickened to a nice consistency. It might not feel like fall here yet, but a bedtime snack of pumpkin pie ice cream and sun-cooked applesauce helped us get into the mood of the season.